Particularly suited for gateless garages, Tannery’s autoChalk® Parkade is a fixed camera LPR system featuring accurate and real time LPR recognition, white list validation for permits, handicapped and VIP parkers, and quick integration into your back end systems.Integrated with Pay by Plate systems (Digital Technology, CALE) autoChalk Parkade optionally blends RFID with LPR to create a fully automatic system with superb vehicle identification. 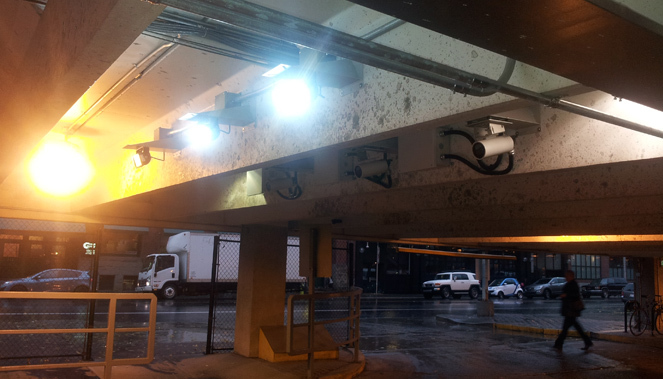 autoChalk cameras and equipment are mounted at all the entry and exit points of the garage. 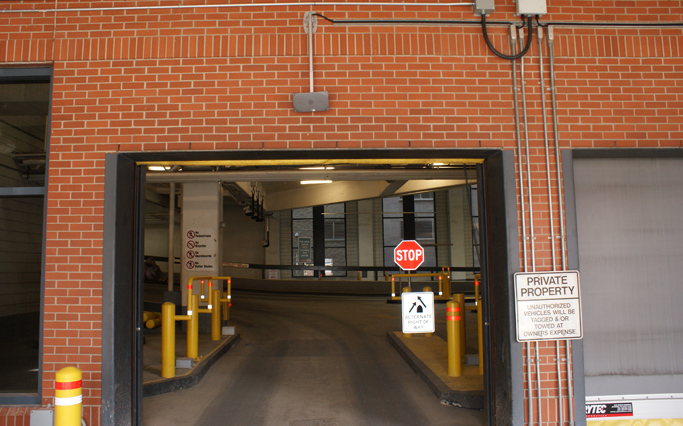 Vehicles entering or exiting the garage are sensed, illuminated and photographed from behind to capture the license plate and tail end of the car. The time stamped photos are forwarded to autoChalk Office which integrates with our paystation partners to identify contract parkers, daily paying customers, and non paying violators. Potential violations are reviewed by staff and legitimate violations mailed. What if you can’t mailout citations? No problem! autoChalk Parkade can send an SMS or email once the number of potential violations has reached a certain threshold. For example, suppose you will send an enforcement officer if ten unpaid vehicles are sitting in your garage. autoChalk sends a text or email alert to your operations command and a PEO is dispatched to enforce on foot or with autoChalk Mobile. Thirsty for more autoChalk information? Please fill in the form below outlining your unique enforcement challenges and how we can help. If you need a more immediate response call us today using the contact info in the contact us page. 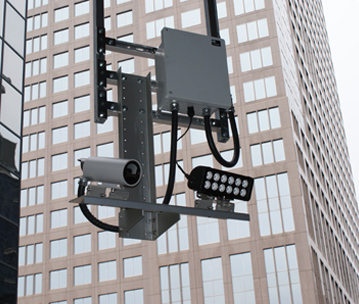 An autonomous fixed camera system requires reliable LPR equipment with little or no down time. autoChalk Parkade operates 24 hours a day 7 days a week. On occasion when the equipment does fail to operate properly, both Tannery and your support team will receive an email or SMS text alert. Tannery will immediately work on remedying the fault. autoChalk Parkade’s robust environmental performance includes operation in frigid winter conditions with temperatures down to -30C (-20°F) up to hot summer conditions of 50C (120°F). All our equipment is housed in tough protective cases to shield it from the elements. Utilizing our experience in mobile, vehicle-mounted LPR, Tannery Creek has applied the same tough and durable equipment to autoChalk Parkade to face the rigours of operating in snow, rain and fog. autoChalk Parkade is suitable for interior or exterior operation. Whether your entrances and exits have narrow bounded lanes or flexible wide multilane, autoChalk can accommodate your installation. 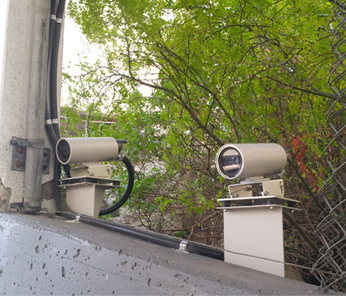 We use a variety of vehicle detection technology to properly detect incoming and outgoing vehicles, and detect vehicles regardless of a visible license plate. autoChalk Parkade does not need a legible license plate to be detected and captured. Generally, staff can review a vehicle and discern the license plate even if it is not readable by the automatic LPR system. In the occasional cases where the plate is simply not legible (e.g. 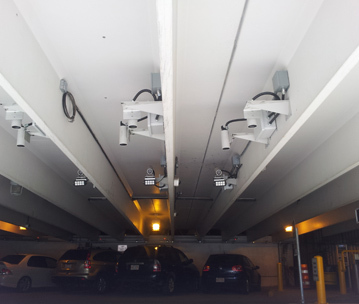 not attached to the vehicle), the excellent photos of the vehicle can be utilized by your staff assigned to walk or drive through the parkade to find the offending vehicle. Using license plates on their own for access control is typically not sufficiently secure to permit access to restricted facilities. For example it is trivial to change or modify digits on a license plate. Looking for a more reliable option? autoChalk offers a more secure vehicle-mounted RFID (Radio Frequency IDentification) solution. RFID accuracy is extraordinary and can be used to automate permit recognition and perform actions such as automatically opening gates and doors without the need for drivers to fish around in their pockets for their fob. Need More Information? Book your demo! Use autoChalk Parkade for Pay by Plate solutions. Tannery Creek has teamed up with companies such as Digital Payment and Cale to provide enforcement. All photographs taken by autoChalk Parkade are processed against available paid sessions. Potential violators are flagged for further review by your enforcement staff. Don’t have the ability to mailout citations? Use autoChalk Parkade to export suspect vehicles via a hotlist to autoChalk Mobile to scan and catch violators. Tannery Creek is very flexible with integrations and we are sensitive to our customers’ needs. Perhaps you already have ticket issuance equipment and just need help finding potential violators? Or maybe you need the vehicles sent off to a third party for counting/utilization? Either way, Tannery Creek will work with you to solve your tough challenges.